This is a well-tended and weed-free guidebook that’s likely to serve as a go-to resource for any type of gardener. One of the most challenging parts of gardening isn’t digging into the soil or dealing with pests—it’s planning appropriately. With such a dizzying array of choices for a garden space, choosing the right plants can be tough, especially with perennials, since they’ll reappear year after year. 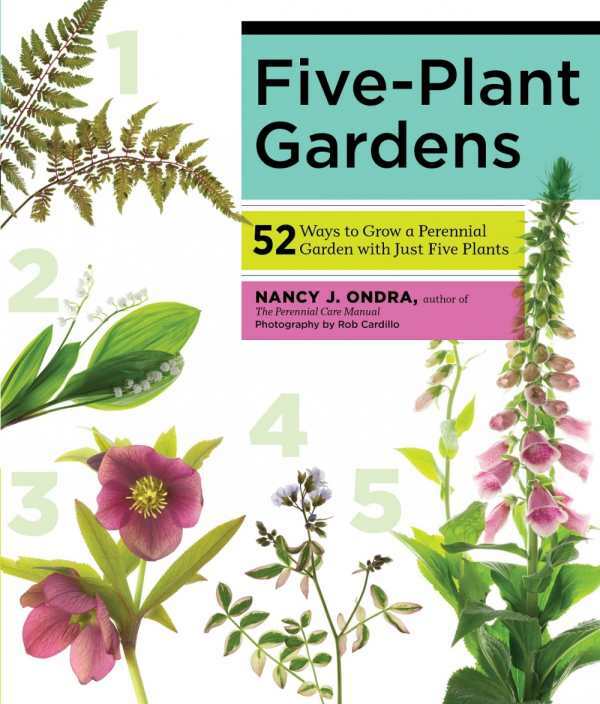 That’s why Nancy J. Ondra’s Five-Plant Gardens is a boon to both experienced and neophyte gardeners. Her straightforward approach and easy-to-follow planting plans take the confusion out of the first-stage process, so gardeners can breeze through planning and jump into planting. Ondra, a garden writer who owned a rare-plant nursery for several years, expertly balances authority with affirmation—her attitude of “you can do this” permeates the guide, giving first-time gardeners a nice dose of reassurance. She also excels at providing advice in a straightforward, clear manner that works very well with the material. Divided into three main sections, Five-Plant Gardens begins with general information on starting a perennial garden from the ground up. She advises that gardeners play off an existing feature in a yard, double-check plant quantities before buying, and focus on smaller and more manageable gardens instead of ambitiously large ones. Where Ondra’s wisdom truly shines is in developing five-plant plans that bring color and resilience into small areas, even if those spaces are completely shaded. Each plan contains a handful of plant options that work well together in terms of size, soil compatibility, and amounts of sunlight and water needed. Also included are diagrams of potential planting arrangements and thoughts on how the plants will bloom during different seasons. For example, Ondra suggests replacing the typical shrub formations found around house foundations with five pretty and hearty options that blend natural grasses with blue-hued flowers. “This collection of perennials supplies year-round interest from a variety of features, including showy flowers, attractive leaves, fall color, and even intriguing seed heads and evergreen foliage for winter,” she writes. Although some plans focus on a dominant color like blue or white, Ondra concentrates more often on creating a complementary blend of colors as well as shapes and heights. For any gardener or potential green thumb looking to make a big impact with a small space, not to mention a limited budget, Ondra’s stellar guide offers a wealth of advice and ideas.